Ah, nothing says Independence Day like the smell of hamburgers on the grill and a dog at your feet. Or, something like that anyway. 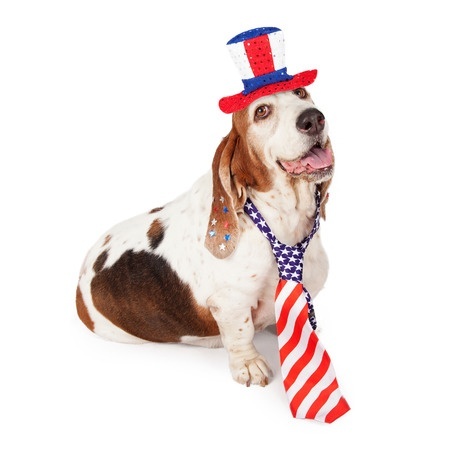 Whatever you do this Fourth of July, there are a few precautions you’ll want to take to protect your dog. The American Humane Association reports July 5 is the busiest day for shelters across the country. The reason is pets get spooked by the fireworks celebrations, run off and get confused. It happened to one of my dogs one year, the fireworks started and he panicked. He got out of the house and ran down the block. Luckily, a neighbor caught him, called my cell (thank you ID tag) and my dog was back almost before I realized he was gone. After that, I always kept him safely inside during fireworks displays. The loud booms and cracks can be scary and hurt your pet’s eardrums. Make sure they’re in a safe place (and secured) during the fireworks. That means a kennel if your dog likes that or maybe closed in a bedroom with some soft music playing. Don’t let your dog gorge on grilled tidbits. Well-meaning folks often like to “share” bits of hamburger, potato salad or hot dogs with your pet. Nothing says midnight tummy ache like over eating. Your dog could easily eat a plate of food from all the “bits and pieces.” Do you want to clean up the aftermath? Monitor your pup’s intake. Check for ticks – Even if your pet wears a flea collar and/or Frontline or another flea/tick treatment, it’s still tick season and they can still get on your pet. The good news is, ticks will find your pet a less desirable environment if they’re wearing protection. The bad news is, the tick will look for a “happy place” which could be you, or your child. Take a few minutes and brush through your pet’s fur after extended periods outside. Check particularly around the ears, paws and base of the tail as that’s where ticks like to hide. Don’t put sunscreen or bug repellant on your pets. They’ll only lick it off and you know that can’t be a good thing. If you’re around water, get a life jacket for your dog and if you’re at the beach, consider keeping dog booties on your pet to protect from the sizzling sand and sand spurs.